Complete with standard and specialty adapters. 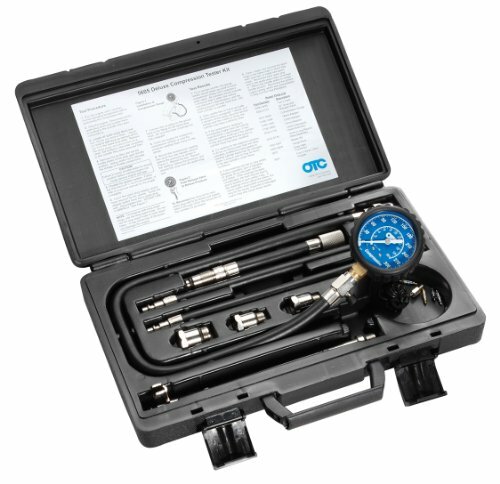 this deluxe kit offers a complete package for compression testing on gasoline engines. Kit includes the deep well connector used on recessed plug well style heads and the new Ford Triton engine adapter using 16 mm thread plugs. Functions and Features: Corrosion resistant nickel plated finish. Adapters work on both flat and tapered seat plugs. Extra long 25" flex hose gauge assembly with quick coupler allows easy viewing out of cluttered engine compartment. 2-1/2" gauge features chrome bezel and rugged protective outer boot. Dual scale gauge reads 0-300 psi and 0-2100 kPa. 8" deep well 14 mm connector. 5" flex Ford Triton 16mm adapter. 12" flex-14 mm standard reach. 12" flex-14 mm long reach. 10 mm. 12mm. and 18 mm thread adapters. Rugged blow molded hard case with removable lid. Repair parts kit.